Digital Marketing or Social Media? Topic: "Quantity vs. Quality: Driving engagement and selecting the right social platforms for you. Why this isn't a job for your intern"
Stacey holds more than a decade of marketin g and advertising experience building premium and mass-market brands across multiple distribution channels. As CMO for Sensa, Stacey drives the brand's acquisition and consumer experience strategy across multiple platforms and technologies. She has played a crucial role in expanding the brand's Internet campaign. 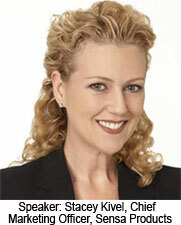 Before joining the SENSA team, Stacey served as Director of Marketing for parent company Intelligent Beauty. In this role, she spearheaded the online advertising efforts for the company's health, beauty and fashion brands. Stacey holds an MBA from the University of Southern California. ChemAid Laboratories, established in 1971, is a leading formulating Contract Manufacturer of beauty products located just outside of New York City, with significant exposure and relationships on the West Coast and throughout the country. ChemAid Labs routinely formulates products to be globally compliant for a largely globally distributed brand base. The diverse and exotic nature of the extensive BioOrganic Concepts® product catalog is no accident. Each ingredient serves a particular function with a rich history of use in diverse health and beauty products. The product list features extraordinary ingredients sourced from far-away places, some familiar, some not. This company was one of the first in the United States to introduce new and unusual natural ingredients to the personal care industry. That tradition continues today.